Forklift training is the first essential step to operating a forklift safely and efficiently. Whether you’re an operator or an employer, forklift training will help you create a safer workplace, reduce accidents, and be more productive. It will also help you avoid costly OSHA fines, legalities, and serious accidents that come with multiple consequences. If you’re looking for the right forklift training program for you, you’ll find our forklift training guide and forklift certification study guide very helpful. Learn more about our online trainer certification! The online trainer program from CertifyMe.net was created to teach experienced operators and personnel how to lead the in-person portion of forklift training for operators. It allows employers to have their own in-house instructors who can train employers on the schedule that works best for them, without having to pay the price for travel to an offsite training facility with a third party training company. “Use this forklift safety self inspection checklist to document your site specific hazards. Helps you develop your company forklift safety program for the training and certification of your operators.” Having an official forklift safety guide will help your workplace reduce the number of accidents you experience and will improve the overall morale and atmosphere of your workplace to be safety-forward. “This train the trainer guide is a solid resource for getting the “buy – in” you need to implement a permanent and sustainable culture of safety in the workplace.” Forklift trainers serve as the leaders for the in person training portion, and this guide can help trainers develop their own forklift license study guide for new operators. They’ll also be able to help new operators prepare for their testing with a forklift test study guide. “A handy chart for comparing the various features and benefits of traditional training and certification vs. leveraging the internet for classroom training and testing.” If you’re considering forgoing the expense and headache of in person training, you’ll really appreciate this forklift certification study guide which gives an honest look at the two options. 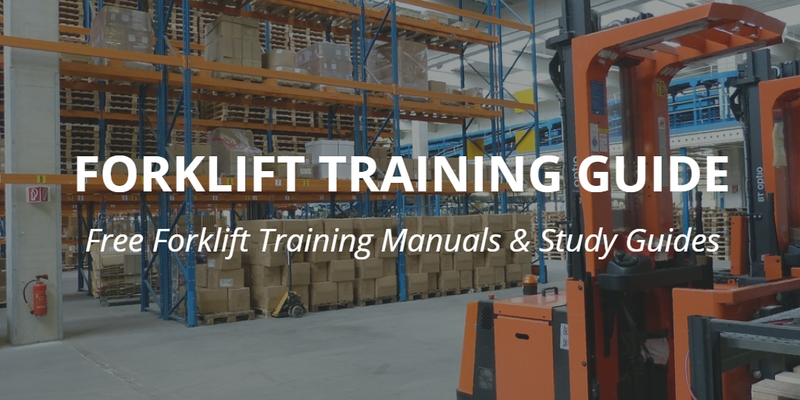 This guide provides forklift training manuals free of cost to help you determine your training needs according to your workplace and OSHA regulations. This handbook is truly an invaluable resource and teaches small businesses the essential components that make up safe forklift operation and how employers can avoid unsafe situations and costly fines. Does each industrial truck have warning horn, whistle, gong, or other device that can be clearly heard above normal noise in the areas where it is operated? Are industrial trucks that operate where flammable gasses, vapors, combustible dust, or ignitable fibers may be present approved for such locations? Are motorized hand and hand/rider trucks designed so that the brakes are applied and power to the drive motor shuts off when the operator releases his or her grip on the device that controls the truck’s travel? Why Should You Get Your Forklift Drivers Trained and Certified? When the new administration took office, OSHA was instructed by the Department of Labor to conduct more frequent inspections and impose heavier fines. According to the Bureau of Labor Statistics, 94 forklift operators have lost their lives in on-the-job incidents. OSHA rules demand that all forklift drivers be properly trained and licensed. Employees are required to undergo both formal as well as hands-on training. We provide both, in addition to a forklift certification study guide with all courses. Why Should You Use CertifyMe.net for your Online Forklift Training and Certification Needs? We provide everything you need to make compliance with OSHA training laws convenient and easy, in addition to a forklift license study guide that helps you be the best possible operator. We have more than 12 years of experience helping companies comply with OSHA regulations. Online training is fast, affordable and can be accomplished by anyone. Our forklift training guide and our OSHA forklift training guide provide all the necessary information and are just some of the forklift training resources we make available to your employees when they are logged in to CertifyMe.net. A trainee can complete the formal online training and testing in about an hour. This can take place before shift, during an extended lunch hour or while on a break. Class is always in session! CertifyMe.net makes it easy to train and certify new hires. Three-year renewals are free. Among the forklift certification resources we make available online include a self-inspection checklist for compliance with OSHA forklift safety, a “train-the-trainer” forklift training guide, an OSHA small business handbook, a forklift test study guide, and more. Looking for how to get forklift certification? You found us! While being totally OSHA-compliant, our forklift training classes can be accessed from any device with an internet connection. Operators complete the training at their own pace and on their own schedule. This takes out the need to schedule the training for all of your operators and require them to travel and take time out of their schedules and your work hours to finish their forklift training. Each of these classes provide a forklift certification study guide and all forklift training manuals free. Once they’ve finished the online modules, they’ll receive a forklift test study guide to use for the written test and the in person evaluation. Your employees will have everything they need to confidently complete their training and feel prepared to operate forklifts safely and efficiently.